The Outpost Tavern burned down Friday night. The Outpost was a rickety little tavern in Houston a couple miles from Johnson Space Center, famous as a hang-out for astronauts and other NASA folks. It went out of business earlier this year and it has apparently now met its fiery demise. I first visited the Outpost when I was in the 2006 Goddard NASA Academy. 20 of us showed up without notice at this little bar with one bartender and a couple of regulars. 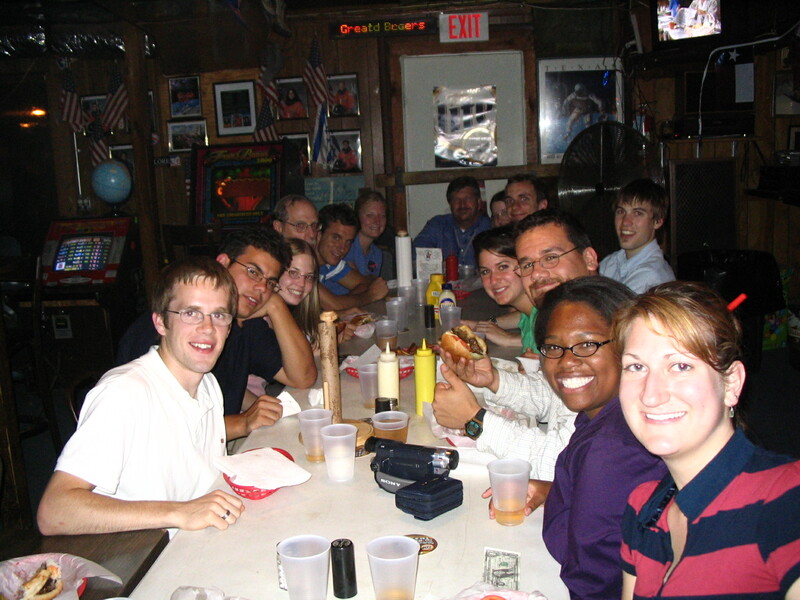 They were completely overwhelmed by the sudden burst of business, but amazingly, the regulars got up and lent the bartender a hand in the kitchen, and we all got our burgers and beer in impressively little time. We followed the tradition and signed our names to a dollar bill and posted it on the wall along with all the other signed bills and various astronaut paraphernalia. Future NASA heroes enjoying dinner at The Outpost. But I mention the end of the Outpost not just so I can share that anecdote with you. I mentioned it because I came across an interesting commentary on the Outpost as a metaphor for NASA in general over at Elliott Potter’s blog Implementation, Detail. Now it’s 40 years later. Our cell phones have more computing power than the Apollo moon landers, yet the Space Shuttle’s proposed successor has barely more computing power than the one on the desk in front of me. Why? Not because it’s hard to put electronics into space, or because spacecraft design somehow excludes modern technology – it’s because small-minded people won’t let science fiction become reality. Those are the people who I think will most lament the passing of The Outpost. Those are the people who bow to the supposed wisdom of yesterday’s paper heroes – Shuttle astronauts who can’t bear to just be scientists or engineers because scientists and engineers aren’t viewed as heroes. I agree with most of this, but I think more than just the Old Guard lament the loss of the Outpost and the era that it stood for. I certainly am sad to see it go even though I share Potter’s disappointment with the tendency for NASA to cling to the past. The early days of NASA have become almost mythological precisely because there were heroes, and it’s very difficult for people to imagine a different type of NASA with different types of heroes. But that’s exactly what we need. The tendency has always been to try to recreate those glory days of NASA, but we live in a different world and we have to accept there are other ways for space exploration to advance. I sincerely hope that as NASA attempts to move forward and send humans to Near Earth Objects and other destinations beyond low-earth orbit, it also remembers how to get the world excited again. I’ve talked about this before and Potter puts his finger on it: NASA needs heroes again, and people need to be comfortable with scientists and engineers being those heroes rather than Buck Rodgers-style steely-eyed missile men. You can show the average person all the spectacular pictures of space that you like, but they won’t truly get excited about what NASA does unless there is a human element to connect with. Human space exploration is perfect for building this connection with the public, but somehow NASA has lost the ability or the willingness to play on the inherent human drama of what it does. America already has the resources to achieve greatness in the future. We already have the knowledge and power to go to the Moon, Mars, and Beyond. It doesn’t require additional support from the President or senators or congressmen or contractors. All it requires is that we learn from the past without being bound by it – that we respect the heroes of our youth without requiring all future heroes to be the same. My children should aspire to be astronauts not through feats of strength or military training, but through preparation, knowledge, and ability – the strengths that make humanity most unique and powerful and able to deal with the unknown. Let The Outpost rest in peace; with it, let our past heroes rest in peace. Let new heroes arise from the ashes: the engineers and scientists who can actually perform the technical miracles we expect from NASA. With the details of all four landing sites on the table, we started day 3 of the meeting by hearing from the engineers and several scientists about the properties of the ellipses, the risks for landing and the capabilities of the landing system. First on the schedule was Mike Watkins, who explained why MSL is so unique in terms of assessing the risk for the landing site because the landing safety is essentially the same for the sites, so the tradeoff becomes more science-oriented and requires a lot more knowledge of the possible targets and traverse distances. 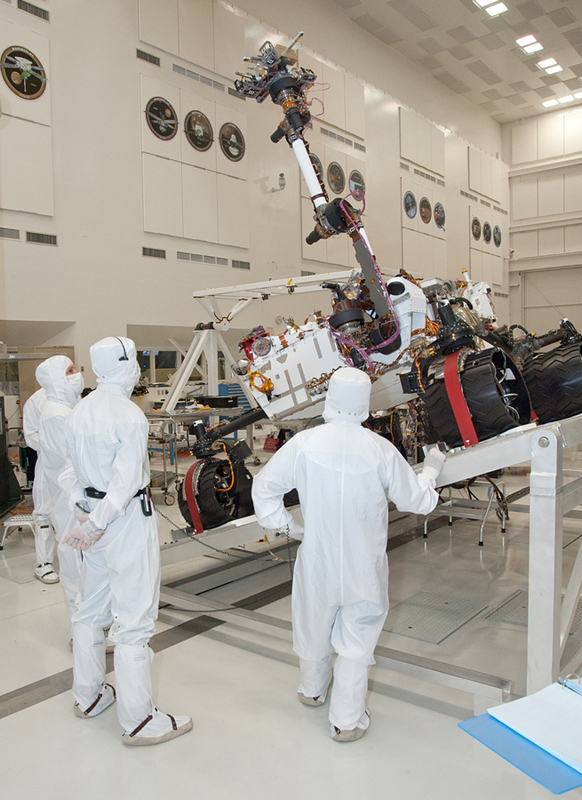 After Watkins, Ashwin Vasavada – the deputy project scientist – told us about the atmospheric simulations that his team has been doing to make sure the weather at the sites won’t mess up the landing system. He pointed out that we are one mars-year away from landing: “The next time Mars goes around the sun, we’ll be there to meet it.” That means that measurements being made right now will be really important in predicting the conditions when MSL arrives. 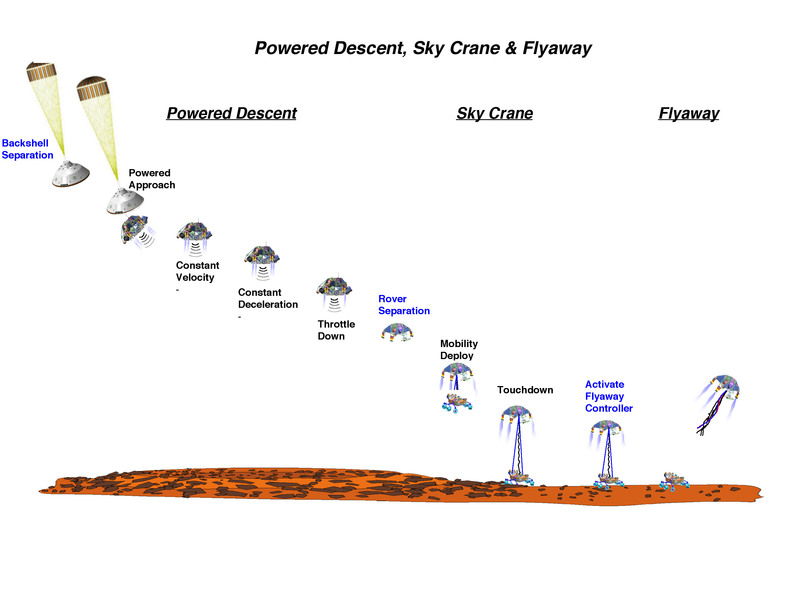 It turns out that unlike previous missions, MSL will actually fly for about 100 km at a pretty constant altitude. This guided flight is what shrinks the ellipses down to nearly circular, but it means that we need to understand the weather for that whole distance. It sounds like the weather at the sites shouldn’t be a problem: Vasavada said that MSL should be able to land even if there is a dust storm occurring at the landing site. Vasavada also showed this interesting plot of day and night temperatures at each landing site, along with an extreme "test case". Next up, Ken Herkenhoff gave a summary of all the processing that goes into making the high-resolution elevation maps based on HiRISE stereo images. It is incredibly complicated to make these things, but they’re extremely important for planning the landing and traverses. Luckily, the folks at USGS have a lot of really clever techniques to make the products possible. 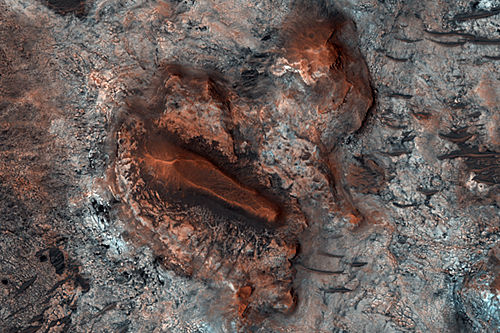 The DTMs are available at the HiRISE website. Matt Golombeck then gave his first of two presentations. This one was about counting rocks in the landing ellipses to make sure they’re safe. For the purposes of his talk, he defined a “rock” as anything that we don’t want to land on or get in the way. Rock counting has been done for all the previous landing sites on Mars, so we have some good “ground truth” to compare with the rock counts from orbit with HiRISE. They use an automated algorithm to count the rocks and then fit the size distribution to a model based on previous sites to predict the number of dangerous rocks that are too small to count. In the past it has been very successful, and they’re confident that all the MSL sites are safe enough. Golombeck said that Holden is especially safe in terms of rocks: “I think there’s maybe one rock in Holden.” There were a couple of very good questions after this talk. 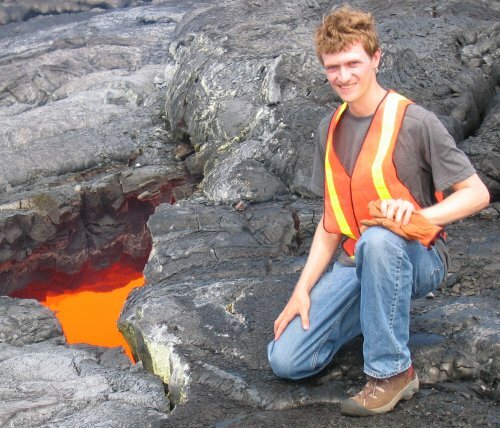 Rob Sullivan asked whether a small softball-sized rock would be a danger if we landed right on it with a wheel, and the answer was basically no. The engineers said that the biggest risk was getting a rock in the belly that would damage the rover and/or prevent it from moving. 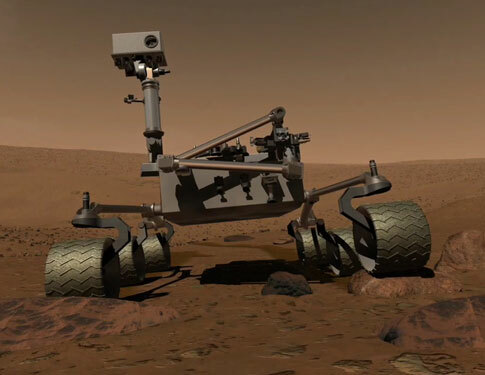 A second question from Steve Ruff was more generally, “how concerned should we be about landing with a hobbled rover?” The engineers said, again, don’t worry about it. They’ve been investigating some scenarios where the landing system might get stressed beyond the point where the materials have a linear behavior, but they aren’t worried about breaking the rover. unaltered bedrock with a dusting of sand or dust on top. Of course, we see other evidence that the rocks at the landing sites are altered, but for the rocks with no clear spectral signatures, I don’t think it’s safe to assume they’re altered based on thermal inertia. 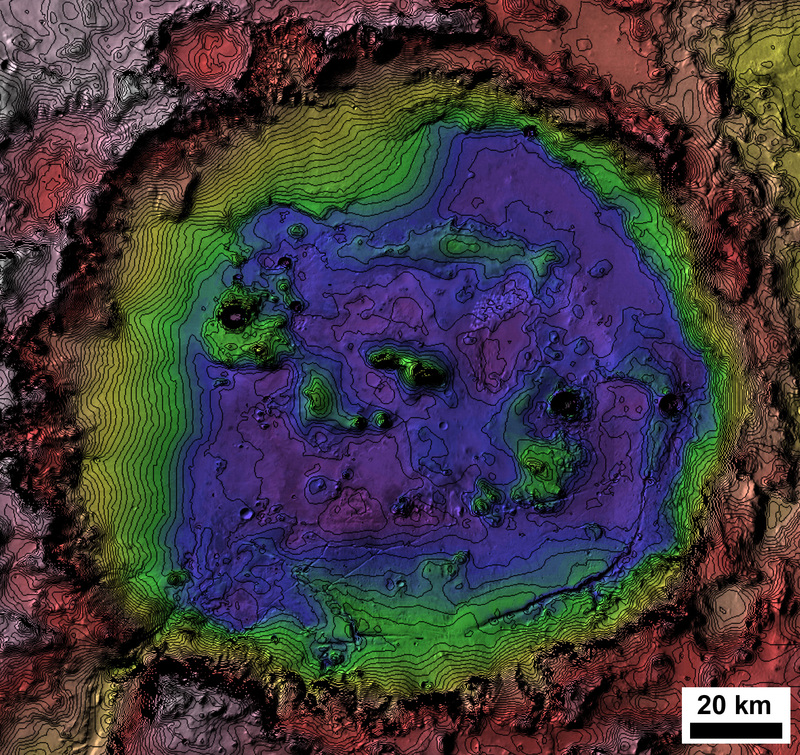 A thermal inertia map of the Gale Crater ellipse. 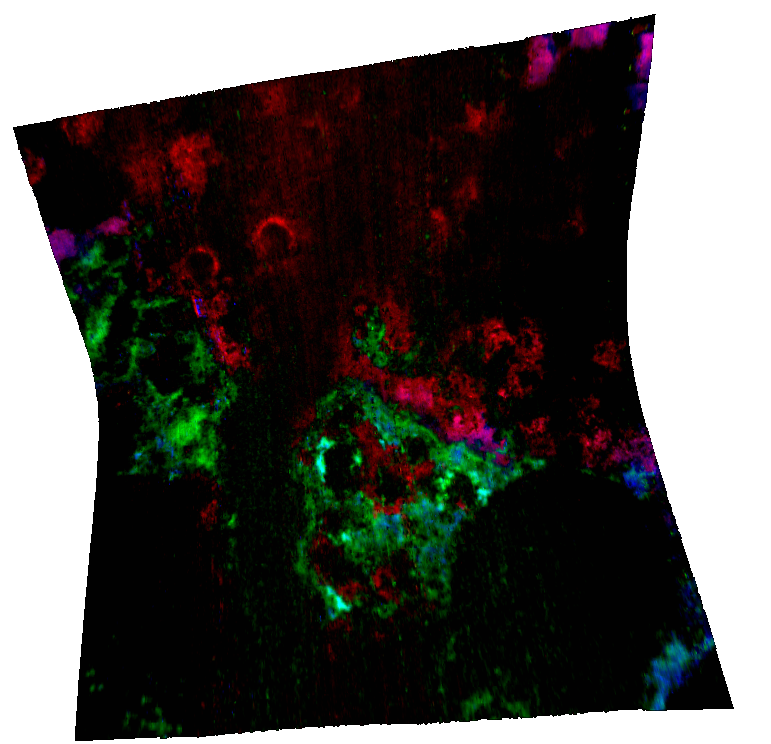 I love how the alluvial fan pops right out in the thermal data! After the thermal inertia discussion, Golombeck got up and gave a presentation with 83 slide in 30 minutes, flashing rapid-fire views of lots of different data-sets used to characterize the ellipses. He also told us that the orientation of the ellipses has changed a little bit so that now their long axis is due east-west. Taking a look at the 5 meter slopes he said that Mawrth and Eberswalde were significantly rougher than Gale and Holden (which makes sense, since Gale and Holden both land on top of nice flat alluvial fans). The topography at Mawrth and Eberswalde would be comparable to that seen in the Columbia hills, where Spirit has been exploring. Golombeck also showed that there are very few “inescapable hazards” such as craters in which you could land but then couldn’t escape. At this point he jokingly made fun of engineer Gentry Lee who had been worried about a big crater in the Mawrth ellipse, saying that the crater was not a target rather than an obstacle! 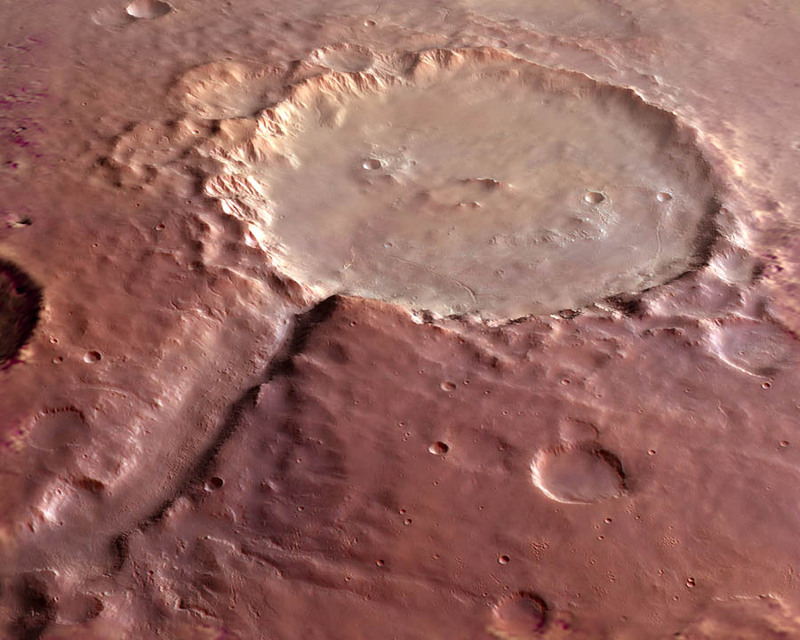 There was also the amusing mention of a small mesa in Eberswalde where MSL would land but would have to go down some pretty steep slopes to escape. This possibility was later refferred to as the “Lion King” scenario by Rob Sullivan. 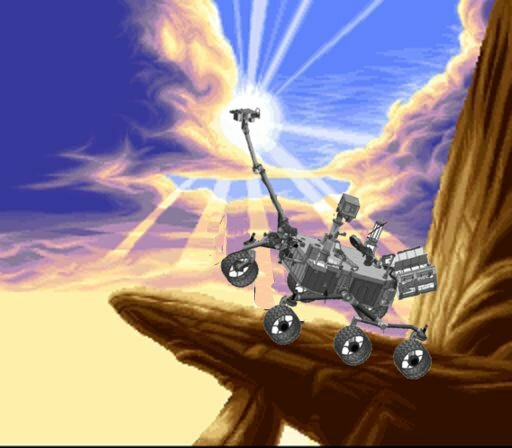 It’s incredibly unlikely, but still hilarious to picture the rover greeting the sunrise from atop this viewpoint, which would, of course, be called Pride Rock. MSL at Pride Rock. I spent too much time making this, but it had to be done. Next, Devin Kipp, one of the engineers on the entry, descent and landing teams gave a presentation that took a look at all the things that could go wrong and basically said “we don’t think these things are going to happen”. He said that the chances of landing success in all of the sites are about 98-99%. Kipp also made the biggest understatement and the best example of NASA engineering-speak all day. When discussing the transition from wheel touchdown to actual roving he said: “hopefully the rover-surface interaction perpetuates for the rest of the mission.” I certainly agree with that! Finally, Paolo Belutta, a rover driver, gave a presentation detailing how the traverse times for each site are going to be predicted. I suspect that these traverse times are going to be the deciding factor for which site is selected. Since landing on the sites is equally safe, the risk gets pushed into the traverse portion of the mission. Belutta is making detailed maps of the sites using HiRISE images and terrain models to estimate how long it will take to drive in any given location. Then, with input from the scientists, he will compute the traverse durations for several options in each of the landing sites. At that point we’ll come to the tough part where we decide whether the cost of a long traverse is worth the possible payoff. Overall, it was an extremely positive morning and I think it laid to rest a lot of concerns that the science community had, based on rumors and partial information that had spread around the science teams. That said, I think it was also presented with full knowledge that this was a public meeting, and that word might get out if they admitted to any major problems. NASA has this mentality where it is afraid to acknowledge the difficulty of what it does until it has done it successfully. Personally, I think NASA should play up the risks and the difficulties ahead of time: they’re really interesting, and they make the final successes that much more exciting, and prepare people for the worst if it happens. In any case, it was a fascinating morning. I’ll post about the big afternoon discussion of all the sites tomorrow. Stay tuned! The final site of the four that we discussed yesterday was Eberswalde, which of course is interesting because of the big delta that is preserved in the western part of the crater.The first presentation on Eberswalde was an impassioned and really interesting talk by terrestrial geomorphologist Bill Dietrich. Bill talked about how Eberswalde is an excellent site for going beyond just making qualitative statements about water on Mars and actually learning quantitative information about the fluvial system. By making surface measurements, Dietrich showed that you can learn things like how much water was actually flowing and what the individual flow events were like. He also talked about the meandering channels in the delta and those seen on the floor of Eberswalde and Gale. Dietrich showed evidence from earth that to form meandering channels you need to have something that strengthens the banks of the river. 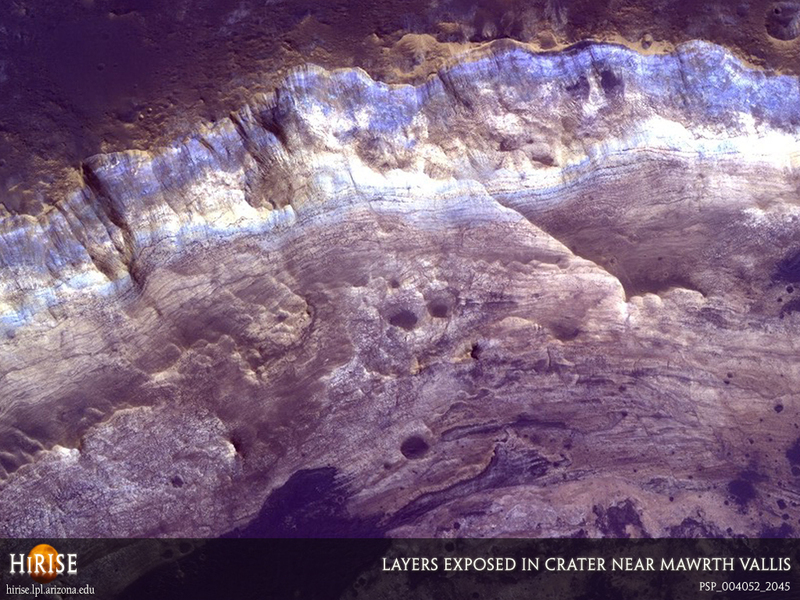 Typically it is vegetation on earth, but ice, clay-sized particles or chemical cements can also do the job, and MSL would be able to tell which of these it was. After Dietrich’s talk, my officemate Melissa Rice gave a presentation highlighting the types of things in the landing ellipse. Her talk pointed out that there’s more to do in Eberswalde than just land and drive due west to the delta: there is a consistent stratigraphy in lots of the outcrops in the ellipse, along with chunks of ejecta from Holden, inverted channels, cemented fractures, and other smaller fans. I think her talk eased a lot of people’s minds who wanted to like Eberswalde but were afraid of a long go-to portion with not a lot to do until you get to the delta. Next up, another terrestrial expert, Sanjeev Gupta gave a talk about the value of a source-to-sink relationship. He started his talk with an aerial photo of a desert landscape on Earth with really complicated geology and had this hilarious quote from when he was a postdoc: “I was ‘skycraned’ into this area, given a three month ‘battery life’ and told to worry about my career.” He went on to drive home how awesome Eberswalde is because you can see exactly where the sediment came from and where it ended up. “Field geologists on Earth would kill to have what we see at Eberswalde.” Gupta also emphasized that at Eberswalde we have a clear testable hypothesis: that the feature observed is a delta that formed in a lake. he also said something that I didn’t know: the slope of a delta is determined by grain size, so the fact that Eberswalde has a very shallow slope suggests very small grain size, which is good for preserving organic molecules. 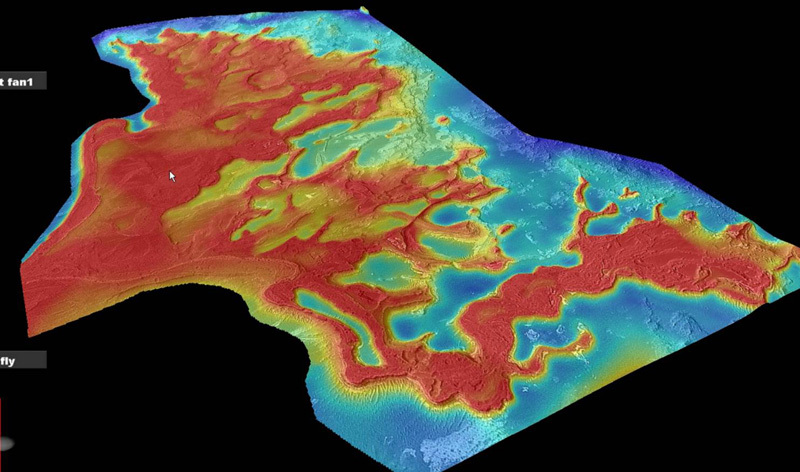 An oblique view of the Eberswalde delta topography. The entire delta is preserved in inverted relief, likely due to coarser grains in the channel beds making them more resistant to erosion. Kevin Lewis gave a sort of summary presentation that also highlighted a couple of important points. 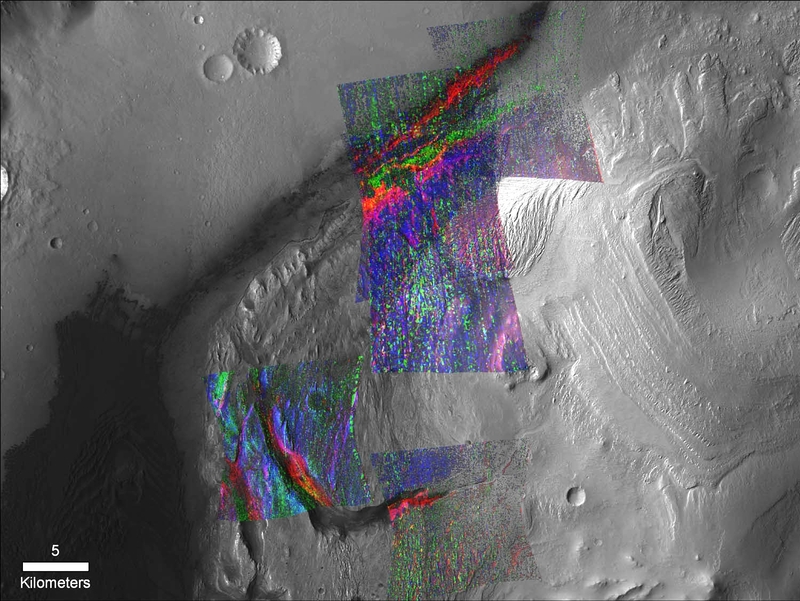 The first is that many of the channels that cut the wall at Eberswalde end at the same elevation, and that elevation matches pretty well with a saddle point where water from the western crater would spill over into the eastern crater. This spillway might have acted like a dam to maintain the water level in Eberswalde at a specific elevation. Lewis also reminded everyone that the presence of a delta gives MSL a “built-in roadmap”: if you want to reach the fine-grained sediment that is most likely to preserve organics, you want to go to the lowest beds in the delta. Finally, Nicolas Mangold gave a very interesting and controversial talk suggesting that all of the flowing water in Eberswalde may be due to the hot ejecta from Holden crater melting ice. 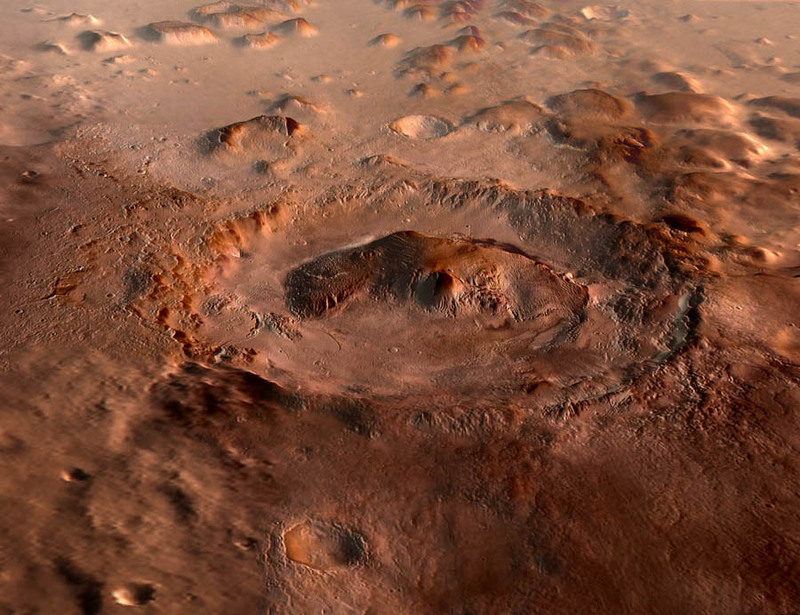 This would mean that Eberswalde could have formed on a Mars that was otherwise not particularly friendly to life and that the lake could have been very transient. 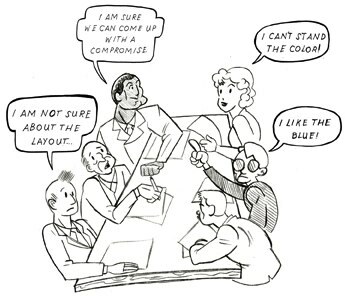 That launched a really vigorous discussion about the site. 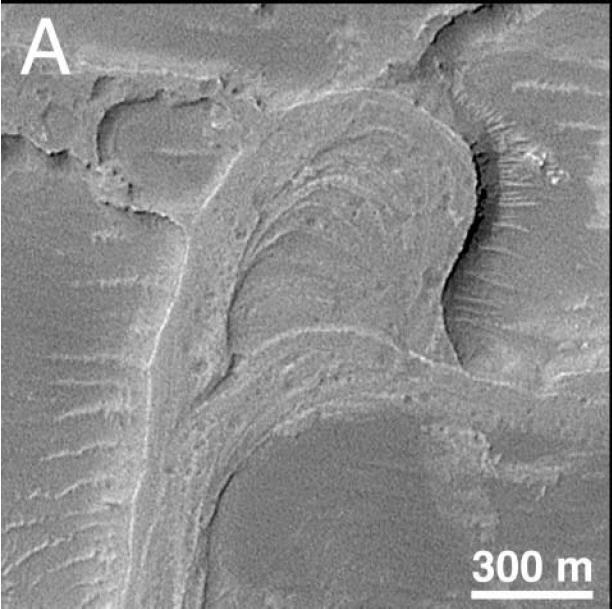 Ross Irwin claimed that the amount of water required to carve the channels in Holden and Eberswalde was way too high to have all come from ejecta-induced melting. 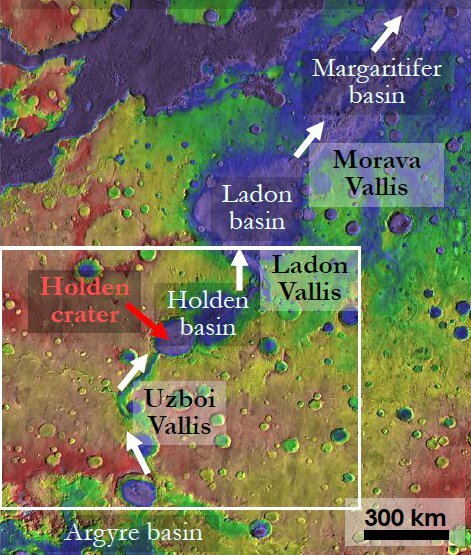 And John Grant pointed to other nearby craters of a similar age that have alluvial fans but would not have been triggered by the Holden impact. There were cries that we need to look for evidence of a shoreline, followed by others responding that it’s unlikely you would see a shoreline. 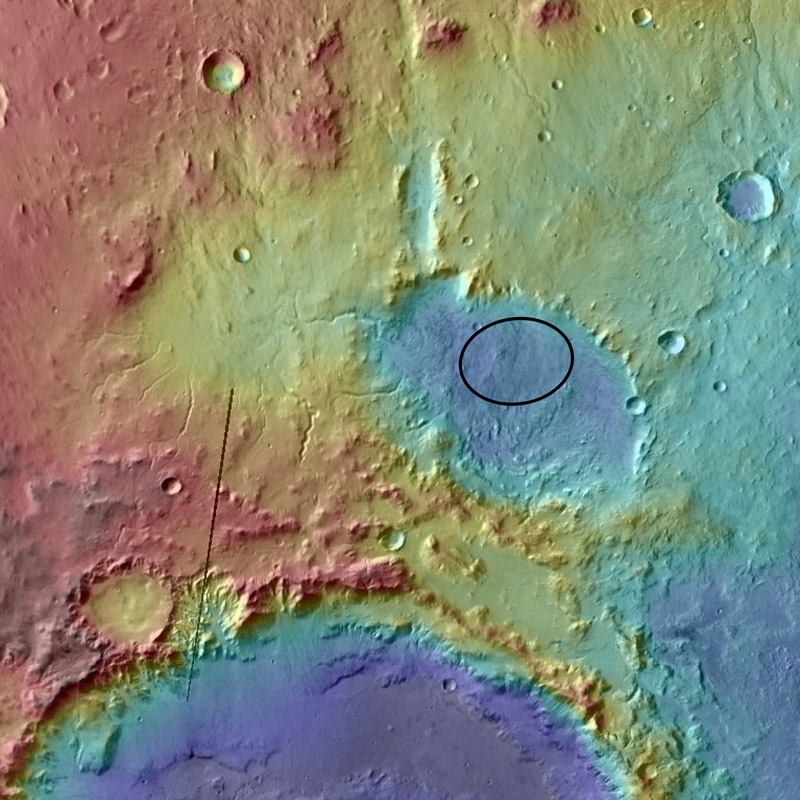 A context topographic view, showing the ellipse in Eberswalde crater. Holden crater is the big crater in the south of this view. There were also a number of questions that appeared to me to be deliberate and rather transparent attempts to make this site look worse than Mawrth. Coincidentally, these questions all came from Mawrth advocates! First, someone asked whether all we would really be learning about at Eberswalde is “what sorts of processes form deltas on Mars”. 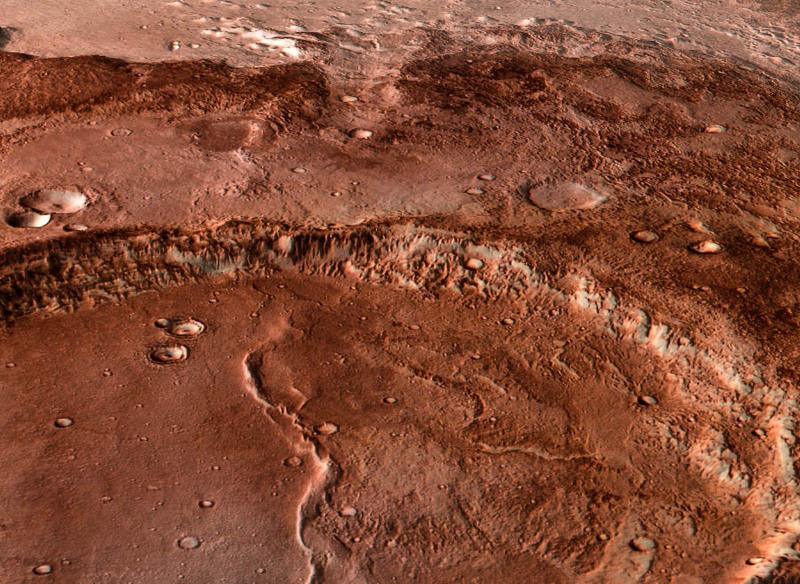 Kelin Whipple responded, saying that if you don’t care about that specific question that’s fine, but by being able to take the study of the hydrologic system to a detailed quatitative level, it teaches you a lot about the climate of early Mars. Sanjeev Gupta also echoed that, saying that the delta gives you information that lets you test the big questions about martian climate. A third example of these rather leading questions was along the lines of: “We’ve been focusing on the structure of this delta, but what do we use all the compositional instruments on MSL for?” The room responded to this one with shocked disbelief before Scott McLennan, a geochemist, pointed out that understanding the context is just as important for geochemistry as it is for fluvial geomorphology. There was a lot more discussion, but those were some of the more “interesting” questions. I found it rather annoying that the Mawrth advocates asked leading questions that they (I hope!) already knew the answer to in an attempt to make Eberswalde look bad. Still, at the end of the day, I think Eberswalde is the clear favorite landing site. The only troubling thing is the possibility that it could have formed rapidly due to melt from the Holden ejecta, and that is the number one thing to look into before we decide to send MSL there. To me, Eberswalde is an incredibly strong site because it fits the MSL objectives almost perfectly. It is the only place on Mars where there is a clear place to look where the processes would concentrate and preserve any organic material that was present. 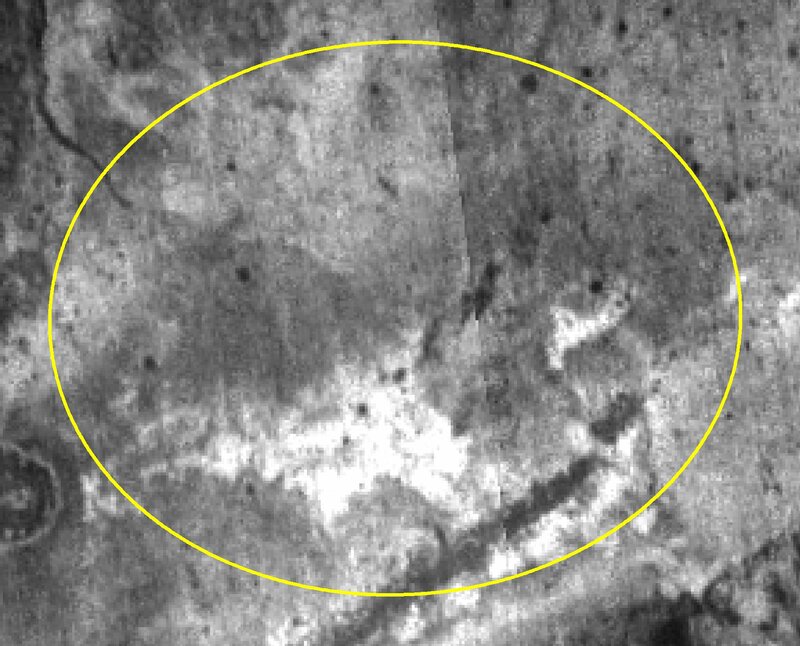 It is the best evidence for lakes on Mars, and toward the end of the discussion of the site, Jim Bell had a good comment. He pointed out that there’s this apocryphal story that MER landed in Gusev and everyone was totally shocked that there was lava there instead of a lake bed. He said that actually there was a lot of debate beforehand. For Eberswalde, the community is much more in agreement that there was a lake. 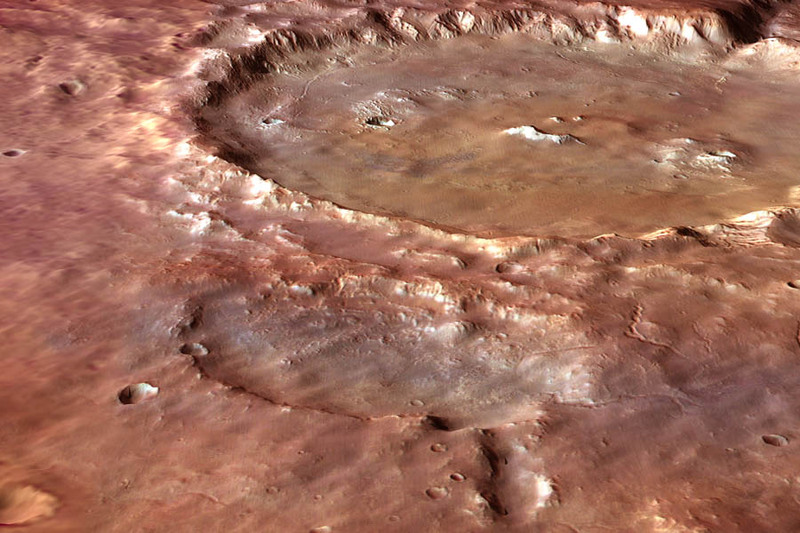 It would obviously be a big deal to visit a lake on Mars, but it would also be a huge result if we went to Eberswalde and it turned out not to be a lake! If you want to read the rest of the discussion of Eberswalde, check my notes. It had, by far, the longest and most interesting discussion session. You can also read ahead to see what we heard about this morning in terms of the safety of the sites, and some sketchy notes of the afternoon discussion. And if you really want the nitty gritty details, the presentations from the landing site meeting are now available online. What is the Best Dinosaur?